Moulay Idriss Zerhoun is part of the Tentative list of Morocco in order to qualify for inclusion in the World Heritage List. I visited this tentative WHS in March 2018 as part of my day trip covering most of the Meknes hotspot. Just before noon, I drove up to the highest hill looking over the hill where Moulay Idriss Zerhoun is perched beneath Mount Zerhoun. On the day of my visit (a Saturday), there was a huge car boot sale and market going on so driving my rental car uphill through the narrow streets packed with locals, improvised stalls and donkeys was quite a challenge. The panoramic view from the top though was well worth it and helped me find my bearings afterwards from one alley to the next around the mosque area (open only to muslims). The experience was quite similar to the medina of Tetouan but here the whole focus of most locals and visitors is on religion. For Moroccans, six pilgrimages to Moulay Idriss Zerhoun during the annual festival honoring Moulay Idriss is equivalent to one Hajj to Mecca. In 789, Moulay Idriss I arrived in Morocco bringing Islam to Morocco and starting a new dynasty. In addition to founding the sacred town named after him, he also initiated the construction of Fes, continued later by his son, Moulay Idriss II. Therefore, the heart of this town is the Mausoleum of Moulay Idriss I accessible only to muslims. A quick peek (photo) just off the main square will still give you a gorgeous view of the central courtyard and minaret. I spent most of my time here watching pilgrims from all walks of life entering/exiting the mausoleum. Another minaret worth viewing, is the green one further away, the only round one in Morocco. It reminded me of a similar but older one present in Male, Maldives. I rather enjoyed the cool whitewashed alleys of Moulay Idriss which we visited on a half day trip that also included nearby Volubilis. We only spent a short time wandering around as it was an excruciatingly hot day, but it was enjoyable, especially when we encountered a group of children who incorporated us into their little water fight. We first walked toward the central tomb complex which looked nice from behind the barriers designating the limits of entry to non-Muslims. It was here we met a guide, who was exceedingly helpful and relaxed. Much like Els I usually avoid hiring guides, but here it seemed the best way to navigate around the small town and our guide turned out to be a knowledgeable and friendly companion and I think we could of even not paid him; though of course we did, but he seemed content to just let us wander off at the end of our tour. We were struggling in the heat, but the view from the top of the hill down into the sanctuary was rather rewarding and we were happy to have put in the effort to climb up. It is hard to say much more as the most important parts of the town were out of bounds but it was a rewarding visit and certainly worthwhile as Volubilis is so nearby. Moulay Idriss Zerhoun is the most important pilgrimage town in Morocco. Here lies the tomb of Moulay Idriss I, the founder of the Idrissid Dynasty and great-grandson of the prophet Mohammed. 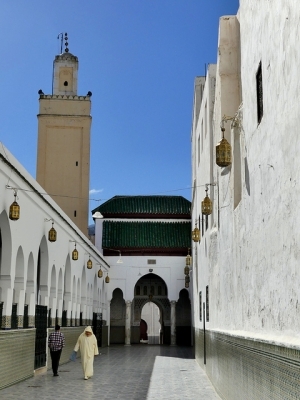 It is said that five visits to Moulay Idriss during festival time (moussem) equals a Hajj to Mecca. Pious as this all may sound like, Moulay Idriss is also a good trip for the non-muslim visitor. The town has a spectacular setting, with its whitewashed houses straddled over (and between) two green hilltops. It can be seen from the WHS of Volubilis (and vice versa). 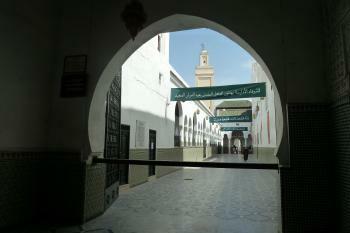 The Mausoleum of Moulay Idriss has a central position in the village. Non-muslims are barred from entering the mausoleum by a wooden barrier, under which also the muslims have to bow down. They enter a complex with dark green roofs, spectacular tiling and plenty of spaces to pray. From there I was picked-up by a 'guide'. I generally use to ignore all these would-be guides (21st century Morocco fortunately has few of them left), but I guessed that he would be able to show me more than I would ever find in this maze. He first lead me to some viewpoints to the side of the mausoleum, from where it is possible to peek in. The complex is mainly open air, and was filled now (Friday afternoon) with praying men and women. Then we climbed lots of stairs. The streets are narrow here and only occupied by cats and little children. And everything is so white! We finally arrived at a terrace with good views of the town and the mausoleum. On our way back to the Grand Taxi stand, we passed a pretty dark green minaret, the only cylindrical one in Morocco. Grand Taxis to Meknes leave from the market square at the lower end of the village. I had mine already waiting, as I hired one of these too large Mercedeses in Meknes for half a day to bring me to both Volubilis and Moulay Idriss and back.